Suppose an elderly person with chronic heart failure starts getting ascites and suddenly develops jaundice and change in mental status. The triad of ascites, jaundice and visible ascites (even mild) is often associated with cirrhosis of the liver caused by excessive alcohol consumption. When the liver becomes injured, jaundice and ascites (fluid buildup in the abdomen) result, and with these two symptoms is an impairment in cognitive function. This situation can occur in an elderly person who’s had chronic heart failure. Initially the clinical picture looks like alcoholic cirrhosis, but a CT scan can rule out cirrhotic scarring, and blood work can rule out toxicity or viral infection to the liver. Or, to put it another way, the liver has finally been tipped over the edge from years of reduced blood flow from the weakening heart. “This triad is not specific for cirrhosis due to alcoholic liver disease,” says Daniel Motola, MD, a top board certified gastroenterologist and hepatologist providing same-day and next-day services in NYC with Gotham Medical Associates. “Firstly, if abrupt in onset this is suggestive of acute liver failure, assuming no underlying liver disease is known previously,” continues Dr. Motola. “The definition of acute liver failure importantly is defined by absence of underlying liver disease (with some exceptions). Don’t let the term “cirrhosis” throw you. This term refers to a scarring or fibrotic lesions on the liver caused by different kinds of liver disease (hepatopathy) – not just from heavy drinking. 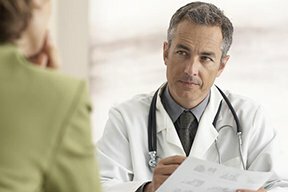 An ER physician might initially assume that a patient with the symptom trio has a history of heavy drinking, but as various test results unfold, the doctor’s initial assessment can change dramatically as far as cause. “Acute liver failure has many causes, including Tylenol overdose, ischemic hepatitis [oxygen depleted liver], hepatotoxins [such as poisonous mushrooms], fulminant failure due to underlying Wilson’s disease, alcoholic hepatitis, reactivation of hepatitis B, etc.,” says Dr. Motola. Dr. Motola says that this symptom triad is “more likely to be seen in a patient with underlying liver injury from their congestive heart failure,” when the other causes have been ruled out. 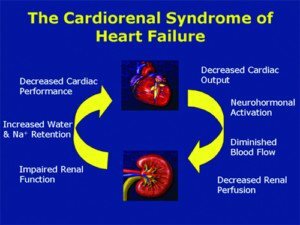 However, it is the kidneys that are usually the much bigger issue in chronic heart failure, such as with cardiorenal syndrome. The medications given to people admitted to the ICU with acute heart failure and pre-existing renal insufficiency can cause further kidney damage. Doctors must aggressively monitor kidney function when medications are adjusted. Acute heart failure has various causes, but a sudden worsening of cardiac function—in an elderly patient already with chronic heart failure—is the leading cause of hospitalization worldwide for people over age 65. “Hepatitis implies many forms of liver inflammation such as viral infection, alcohol, ischemia, etc.,” says Dr. Motola. “Ischemia” refers to lack of adequate oxygen. An “ischemic stroke,” for instance, means a stroke resulting in depleted oxygen supply to a part of the brain. “Ischemic liver” means that this organ has not received enough oxygen to function properly. “There has to be severe liver dysfunction with elevated bilirubin, INR and elevated liver enzymes to cause hepatic encephalopathy,” says Dr. Motola. Hepatic encephalopathy means impaired cognition due to liver dysfunction, typically characterized by inability to concentrate or focus, impaired conversational ability, confusion and a low state of arousal. Cardiac cirrhosis is liver disease caused by poor cardiac output. For a while the liver can compensate or stay afloat as far as function, without any clinical signs. But at some point it may decompensate—or to put it succinctly, throw in the towel. Such a liver is “tipped over by further heart failure leading to decompensation,” says Dr. Motola. But until such a liver decompensates, “Cirrhotic patients can walk around and appear to have no evidence of liver disease until they decompensate and develop jaundice, ascites and hepatic encephalopathy,” explains Dr. Motola. “This is the end stage of cirrhosis, when there is clinical state of decompensation. Treating the underlying heart failure may reverse these signs but not the underlying cirrhosis. In short, the prognosis is extremely bleak. First off, treatment (drug administration and lifestyle changes) for chronic heart failure does not make the heart fitter or stronger; it only slows down the decline. For instance, treatment with a diuretic and low sodium diet helps prevent fluid buildup around the heart, which would further damage it. Second, when the heart is so frail and old that only a heart transplant can save the aged patient, the irony is that the patient would already be too weak to survive the surgery and thus deemed not a suitable transplant candidate. In fact, such a patient may have only a projected week to live, and hence wouldn’t even live long enough before both a compatible donor heart and liver became available! If you are interested in a consultation with one of Gotham Medical Associates’ gastroenterologists please call 212-227-3688 or book online. Our staff will be happy to assist you, your family member or friend. In addition to his liver transplant expertise, Dr. Motola offers expertise in chronic liver disease, GERD, IBS, colon cancer screening, endoscopy and disorders of the bile ducts and gallbladder. Can Ascites Cause Acute Decompensated Heart Failure?